NEW YORK (TheStreet) -- In a recent TheStreet article, Rocco Pendolla explained the disastrous state of Sears (SHLD and his headline spot on: Sears: A Pathetic Picture Is Worth 1,000 Words. Well, like Rocco, I have another picture for you worth 1,000 words. 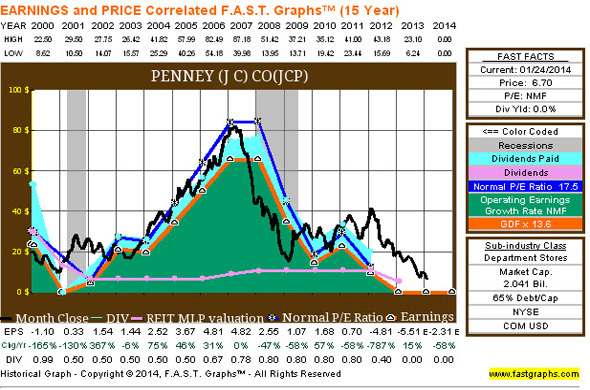 Much like Sears, J.C. Penney (JCP - Get Report) has fallen on hard times. The Plano, Texas-based department store chain began as a public company in 1929 and grew at an incredible pace, with shares topping $85 in 2007. However, in 2009 the shares bottomed out to around $14, and more recently they sank to a two decade low of around $6.80. Its shares currently trade around $6.50 and are down 28% for the year to date. As the FAST Graph below illustrates, Penney is scrapping the bottom of the barrel, with no dividend and liquidity of around $2 billion ($1.7 billion in cash and $480 million of credit). 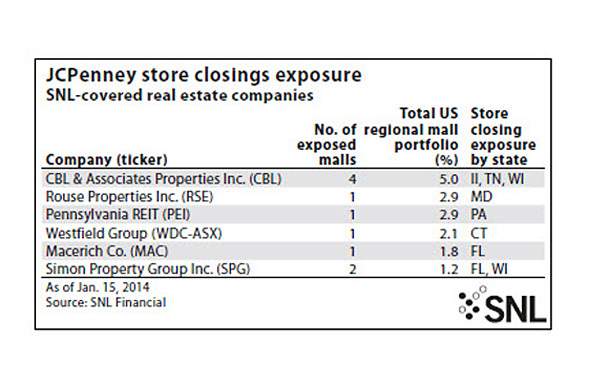 That may seem like a lot of cash but remember, Penney has some off-balance sheet obligations to worry about. As per the most recent 10-K, Penney's has 1,104 stores located in 49 states and Puerto Rico. Of these sites, the company owns 429 buildings and leases 775 stores (of which 123 are ground leased). That means Penney is obligated to pay around 775 landlords for its services, renting space primarily in malls across the U.S.
Penney's latest quarter saw red ink of around $490 million (in net income) and negative operating cash flow of approximately $700 million. The company's average sales per square feet have dropped from $160 in 2008 to $116 in 2012; a clear indicator that losses are mounting and liquidity is under fire. On Jan. 15, Penney announced a "strategic initiative" -- a band-aid -- to close 33 under-performing stores as part of "its turnaround efforts." Around 25% of the closures (10) are owned by REIT landlords: four are owned by CBL Properties (CBL - Get Report), two owned by Simon (SPG - Get Report), one by Westfield (WDC - Get Report), one by Rouse (RSE, one by Macerich Co. (MAC - Get Report) and one by Pennsylvania REIT (PEI - Get Report). Penney said the company may save around $65 million beginning in 2014. However, the landlords with the lowest-quality properties will likely see more closures in the upcoming months. Investors should pay close attention to Penney's off-balance sheet assets as they could be the final straw that makes or breaks the 85-year-old chain. Conversely, REIT Investors should monitor their portfolio of assets and determine whether or not there is a "margin of safety" that will insure REIT investors against a tenant bankruptcy. Now may be a good time to consider the REITs with more necessity-based revenue. Some of my favorites include Excel Trust (EXL, yielding 6.23%, or Inland Real Estate Corp. (IRC, yielding 5.48%. Also, a more defensive play may be to move up the quality ladder and invest in the "blue-chip" mall landlord Taubman Centers (TCO - Get Report). I really like the foot traffic that Taubman's malls generate and the consistency of the earnings is directly correlated with the sustainable dividend record -- a 15-year streak of never cutting a dividend (the current yield is 3.13%). More information on REIT investing can be found in my monthly newsletter.